ABOVE: Munich museums near the Viktualienmarkt. This travel guide to Munich, Germany is designed to help you plan your trip to one of Germany's most exciting cities. Munich, the capital of Bavaria, is packed with sightseeing opportunities, museums, shopping, restaurants, beer halls, and other attractions for tourists. Just as important, it's within two hours of the German Alps (see our Garmisch-Partenkirchen and Zugspitze articles) and Salzburg, Austria. 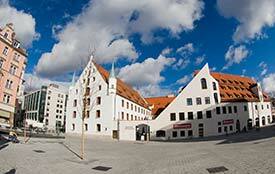 Fascinating medieval towns such as Regensburg and Rothenburg ob der Tauber are also nearby. With two major railroad stations and Munich International Airport (which has earned several "Best Airport in Europe" awards), Munich is a great place to begin or complete your trip to Germany. To begin planning your trip, continue to the next page or use the navigation links below. Also see our Munich home page for a complete listing of our Munich articles, and our Germany home page for travel guides to other German cities.